This past Friday, my family and I were having a fajita Friday! Being a family that has both vegetarians and non-vegetarians, I love making fajitas since they’re so customizable. To make gluten-free and low sodium tortillas, I was making corn tortillas from scratch. 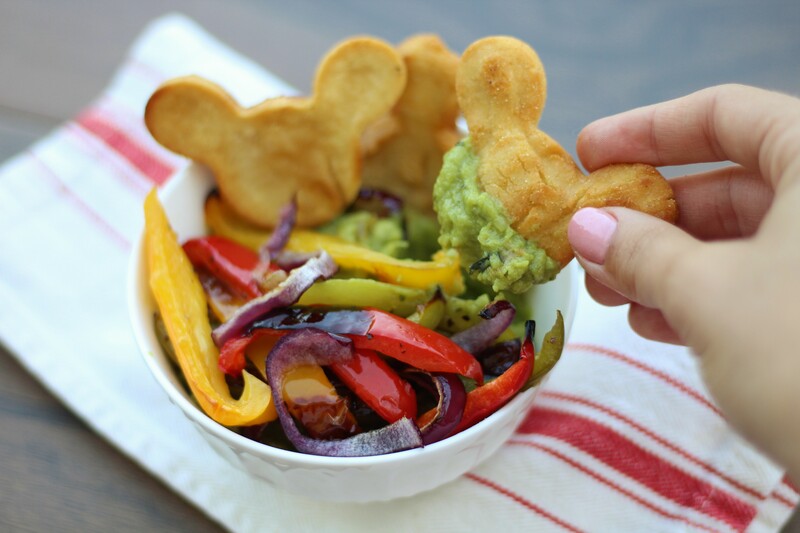 But then I thought it might be fun to make them Mickey-Shaped, and then lightly pan fry them for a fluffy yet crunch Mickey-Shaped corn chip to dip with my homemade guacamole and sauteed veggies! Guacamole – you can find my healthy and simple guacamole recipe here. For your basic fajita veggies, preheat the oven to 375 degrees F.
Cut bell peppers and red onions in strips, and toss in salt, pepper, and olive oil. Place in the oven for about 30 minutes. Meanwhile, you can make your guacamole according to my recipe (see above). To make your Mickey shaped chips, mix together your Maseca and water. Press your mixture using a tortillas press. Or, press it flat onto a cutting board. Use a small Mickey-shaped cookie cutter to cut into Mickey shaped chips. Pour olive oil to fill the bottom of a large pan. Place your Mickey shaped chips to cook, turning over once crisp on each side. Guacamole - you can find my healthy and simple guacamole recipe here. Dumbo’s Peanut Butter Pudding – Vegan and Gluten-Free!